First up, the Mossberg booth. They are showing their 510 mini-pump, the smallest pump-action in the world. In fact, the pump itself is an inch and a half shorter than any of their previous models. But waterfowlers will really love the 535 ATS (All Terrain Series), which comes with the Mossberg LPA (Lightening Pump Action) trigger. It is a skeletonized trigger that you can adjust at home with a Phillipshead screwdriver, from 7 pounds all the way down to 2. You read right — no more running to the gun shop to have your trigger adjusted to your liking. 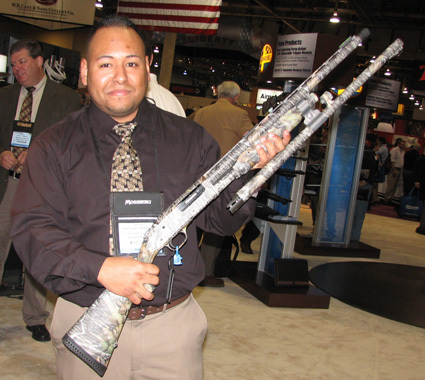 The ATS, which comes in 12-gauge and with three chokes included, is coated for durability. The Ruger Red Labels on display here are almost-too-gorgeous-to-carry. They have a stainless-steel receiver and a dovetailed, free-floating rib with a brass bead front sight. You can get one in 12-, 20- or 28-gauge and five choke tubes are included. The SA-08, the Weatherby semi-auto, comes with a chrome-lined barrel for durability and a drop-out trigger system that allows for easy cleaning and adjustment. It utilizes a dual valve system with internal dampening, and the bolt is also chrome-plated for smooth, non-binding action. 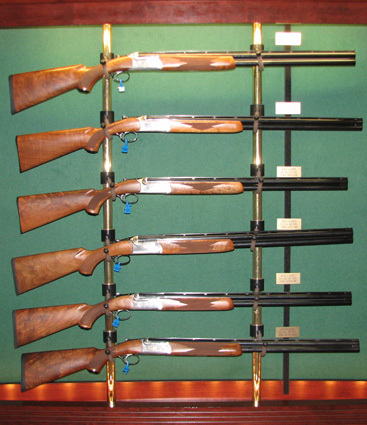 You can get one in 12- or 20-gauge in black synthetic or walnut. Three choke tubes are included and it will handle anything from 7/8-oz. to 3-inch loads. You can change the piston out depending on if you are shooting a really light or a heavier load. The SA-08 is one of the more affordable semis on the market, too. Available in 12-gauge with a 28-inch barrel and capable of handling 2 3/4- to 3 1/2-inch loads, the 11-87 Sportsman Super Mag Waterfowl comes in synthetic Mossy Oak Duck Blind with gray overmolded grips — really handy for keeping a tight grip on the gun when things get wet and slick on a rainy day. It has a HiViz front sight and screw-out choke tube — three chokes come packaged with the gun. MSRP is $998 but you will find it on dealer shelves for less. Well I fell in love with the Browning o/u Cynergy on the clays course at Media Day, but that is a story for another time. Today I was introduced to the Maxus, a gas-operated semi. It comes in 3- or 3 1/2-inch and will handle any load from 1-oz. on up. You can get it in Duck Blind or black, both with the DuraTouch armored coating to provide a really sure grip. One of the stand-out features on the Maxus is the lack of a magazine cap — just a little lever to flick and the forearm drops away, giving you fast and simple access for cleaning. Comes with three choke tubes. 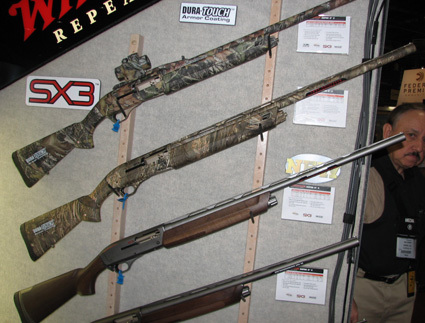 The updated SX3 comes in 12- and 20-gauge. You have options in the 12, but the 20 comes only in wood stock — which, being a walnut devotee myself, I am pleased. The synthetic version has the same DuraTouch armor coating you will find on other Brownings. 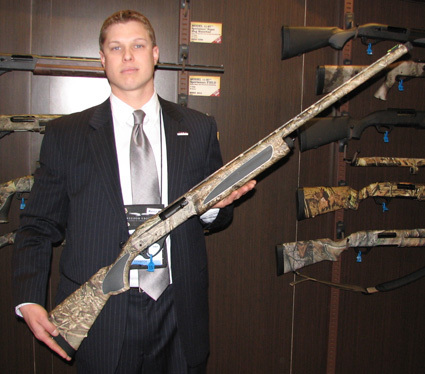 This gun comes with three choke tubes and 12-gauge handles 3 1/2-inch loads. As you have probably heard, Benelli followed up its immensely popular Super Black Eagle II with the Vinci, an inertia system that features very linear recoil — that means the recoil comes straight back and muzzle rise is significantly reduced. They claim the Comfort Tech Plus stock reduces recoil by 70% compared to a traditional inertia system. 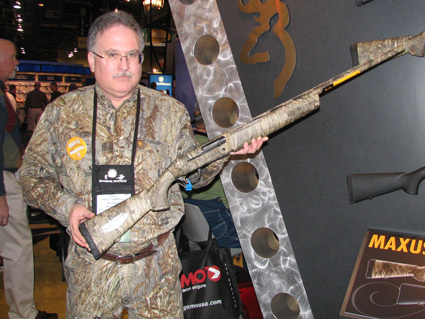 The Vinci comes in 12-gauge only with a 26- or 28-inch barrel, handling 3- to 2 3/4-inch loads. You can get it in black, Max-4 or APG and there is an optional pistol-grip accessory. MSRP is $1,299 for the black and $1,399 for camo.